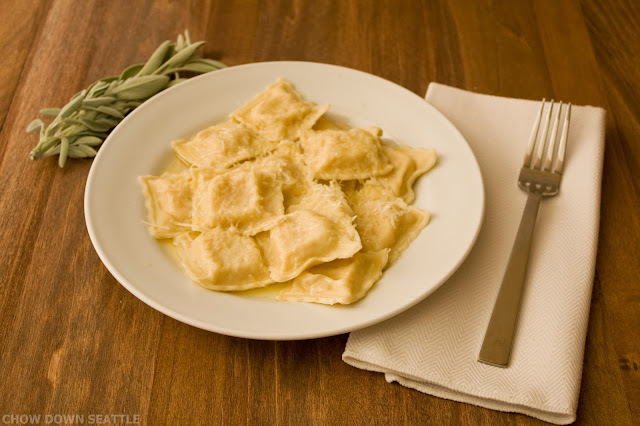 Fresh Pumpkin Ravioli with Sage Butter and Parmigiano-Reggiano Cheese. Like I have mentioned before, I love pasta! Tonight I decided to try making some fresh pumpkin ravioli. The end result was quite tasty. One thing that I will try to improve the next time I make this is to puree the fresh pumpkin a bit more. The pumpkin filling tasted just fine, but I would have liked the texture to have been a little smoother. The ravioli is topped off with some sage butter and fresh grated Parmigiano-Reggiano cheese. I used a recipe from Williams-Sonoma. You can find the recipe here. This recipe was pretty easy to make. It does take some time to make it as you need to roast the pumpkin for about 50 minutes. But during that time, you can make your fresh pasta. Making fresh pasta is a lot of fun, and it tastes so much better than store bought pasta. Having a glass or two of wine while you're making the pasta adds to the fun too! 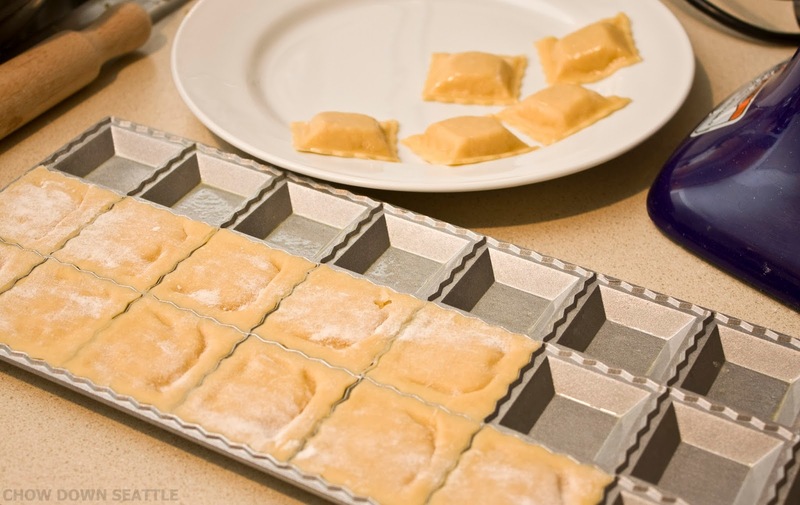 Fresh ravioli out of the tray.